A new storage sewer built of Flowtite GRP pipes by Amiblu was installed in North Rhine-Westphalia to prevent floodings during periods of heavy rain. Parts of the city of Mülheim in Western Germany were regularly flooded during heavy rain. Short-term measures such as a backflow valve or storm drains did not prove sufficient to protect local residents. After a few calculations and considerations, it became clear that a storage sewer would be the best solution for this pressing issue. 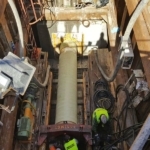 The contracting company Medl GmbH suggested to modify a section of the existing combined sewer pipeline into a more voluminous storage chamber. This would enable the wastewater to slow down before it continues its flow in a controlled manner through the remaining sewer line DN 900. Due to several challenging framework conditions, this was easier said than done. The adjacent road is rather narrow with a number of supply lines for gas, water, electricity, and telecommunications running on both of its sides, and parts of the storage sewer would have only little soil cover at a high groundwater level. Circumstances that called for a durable, flexible, and easy-to-handle solution – for the planners, an obvious choice: They went for GRP, and Amiblu was commissioned with the project. The relatively thin-walled yet very stable GRP pipes outscored concrete in terms of space: The required construction pit was decisively smaller, meaning that the groundwater level did not have to be lowered as much. The pipes’ light weight and easy handling was another great advantage on the narrow construction site. And: “Thanks to the smooth inside surface and excellent flow characteristics of our pipes, we could go without a dry weather channel”, says Holger Hörnemann, area sales manager of Amiblu. 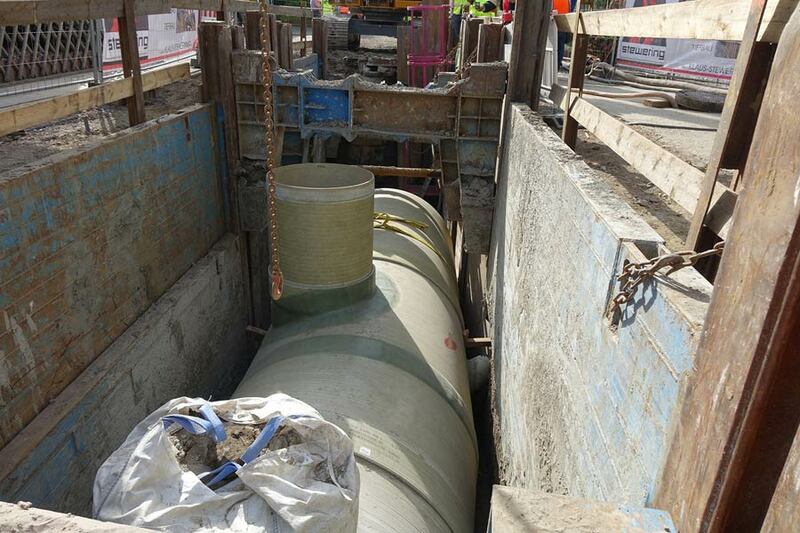 125 m Flowtite GRP pipes DN 2300 in 3 m lengths, an intake and a flow control shaft, and three further manholes were supplied to the construction site in Mülheim just-in-time – the restricted space did not allow for any product storage. After laying and connecting the pipes, the trench was filled with self-compacting liquid soil. All works were successfully completed end of March 2019 and the citizens of Mülheim are now equipped for all future heavy rainfalls.